Brenpa’s Kitchen is creating a new way of bringing real, healthy, clean, nutritious food into people’s tummies. We’ve brewed a magical Tibetan elixir through a combination of local, organic, sustainable, intentional practices and distributing via the gift economy. It will warm your heart just as much as your belly! 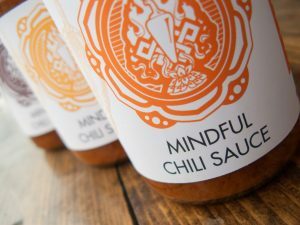 The first gift to come outta the kitchen is our Mindful Chili Sauce. Infused with loving healing mantras and a unique addictive flavor, this versatile all-purpose chili sauce will become a regular guest at every meal. Be curious and try it with different recipes. It is sure to enhance the deliciousness! We strive to use organic, locally sourced natural ingredients when available. The physical ingredients are: Onion, tomato, garlic, serrano & habanero peppers, curry powder, sea salt, & olive oil. 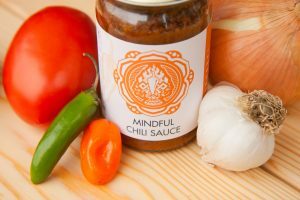 We believe intentions carry vibrational messages, so we infuse our Mindful Chili Sauce with spiritual ingredients such as mantras of love, compassion, healing, and joy throughout the creation process. One of the common mantras we recite during the cooking process is “Om Mani Padme Hum” which has multiple meanings as it encompasses profound wisdom of the Buddha of Compassion. Another prayer we regularly recite throughout the process is a mantra of Medicine Buddha which clears off all confusion and ignorance that leads to sickness of body, mind and spirit and opens them to wisdom, clarity and compassion. quickly be freed from sickness.